Creative, intelligent, thoughtful and worldly, Maia is an eclectic part of the Attollo team! Whether she is making someone a unique birthday card, getting a new tattoo (she has 11!) or experimenting with her sense of fashion, Maia always brings her own style to the table. 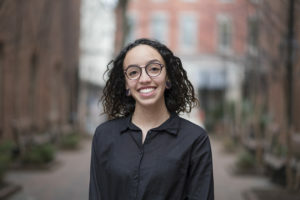 She is from the Lancaster-area and is a graduate of Conestoga Valley High School and Penn State where she earned her Bachelor’s in Global Studies in December 2017. Maia has a wide range of passions starting with Hayao Miyazaki. Anyone going to Japan soon? If so, take Maia, with you, she’s a die-hard Studio Ghibli fan and has always wanted to visit the museum in Japan. Speaking of traveling, Maia has already been to Korea and Switzerland where she has picked up keepsakes like a tattoo of Korea’s national flower, and traditional Korean literature. To make the most impact at Attollo, Maia will draw from her experience as a Writing Assistant and a Teaching Assistant as well as from studying at one of the most prestigious private schools in Korea, Yonsei University.